My first night in Belgium was just 500 meters from the border. Marc & Christie are most excellent hosts. After a frigid, windy day of cycling, a seat by the wood stove and a few kind words from Christie made me feel at home. In the morning, Marc guided me 30 kilometers into the city of Antwerp, half of it before daylight. I felt privileged to share hard day in Marc’s life. Regards, my friend. The cities are full of architecture and history. I was awed to see a church from miles away, growing larger on the horizon as I approached, then find myself standing before before it in the city, gawking upward like a tourist. To a peasant 500 years ago, it must have been life-changing. After an hour in a cafe with Peggy and the boys, warming my feet, Antwerp showed me something new: a tunnel under the river with huge, art-deco elevators at each end bringing cyclists 39 meters (!!) down to the tunnel. Twenty-degree, twenty-mph winds blew me into Ghent, with TWO huge cathedrals on the main square, and a farmer’s market dating from the middle ages. My gear is working, if not exactly keeping me warm. I get sweaty, my feet get cold, and stopping is problematic. I’ve stopped drinking caffeine, and after blowing my budget to bits in Amstedam, I’m too cheap to buy lunch. At midday I find shelter from the wind behind a wall or shed, or in a glass-walled bus stop, in the sun, and eat my sandwiches. At every breakfast so far, whether Warm Showers or a hotel, there has been sandwich fixings; decent bread, ham, cheese, butter, preserves. In town I go to McDonald’s. Always free wi-fi and they don’t seem to care if I buy or not. Big glass gives me a good eye on the bike (still no lock). Sometimes I get fries. I’m in one right now in Roubaix. I don’t have the nerve to bring in my sandwiches. And then the snow came. Reaching the home of Francis in Lille (adjacent to Roubaix), was a challenge I do not wish to repeat. Friday big-city rush hour, after dark in an area that does not often see snow, temperature 20F, heavy snowfall and comically slippery intersections. All I can say is I made it. Francis is a most interesting young man. Speaking British, he told me of his travels, his education (history), and his recent career as logistics coordinator with an equestrian theater troupe. His job: move up to forty horses to and from the world’s great cities by truck, train, and airplane, and care for them for months during their stay. He even performs on horseback a bit. He treated me to some great local beer. 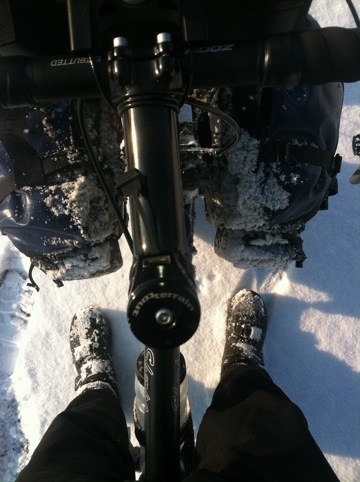 Next day we rode together in the bright sun, freezing cold, with two inches of snow squeaking under our tires. After a short tour of historic and beautiful Lille, the roads were getting sloppy, so we followed canal-side paths to Lens. Fresh tracks! Francis took the train home and I was sorry to part company. The rest of the trip to Arras, through WW1 graveyards and depressed former coal mining towns, was a struggle. Wet with sweat and freezing, and with painfully cold feet, the kilometers dragged and I pushed on. Finally my cheap motel appeared, and I started my routine: crank up the heat, hang up my wool to dry, rinse out my silks in the sink, and start typing on the tiny keyboard, checking e-mail and planning the next few days’ routes A Warm Shower near Paris, good. Plan some routes and e-mail some Warm Showers a few days away. Eat food. The weather forecast is for cold and wind, a little snow. I haven’t taken a day off since England. Even though the days seem like epic struggles, I’m only covering forty to fifty miles, sometimes less. Creeping across the map. Hours in the cold wind. Some of you have told me the photos don’t show up, others are seeing them. I don’t know; I take them with my phone and use this WordPress blog tool to post them. I have taken damn few. There are photos of cathedrals and the like, better than I could take, easily available. Lately my hands are full anyway. But I’ll try harder. I’ll try to post more frequently, too. But that’s all for now. I must clean this bike and get ready for tomorrow. it seems so unfair that we’re enjoying one of the most mild winters in recent memory while you schlep through snow. yesterday in bennington, vermont it was sunny and nearly fifty degrees. the winter that never was. i appreciate the routine you described and you continue to be the most fearless person i know. keep spinning and keep posting. and for god sake, bring your sandwiches into mcdonald’s!